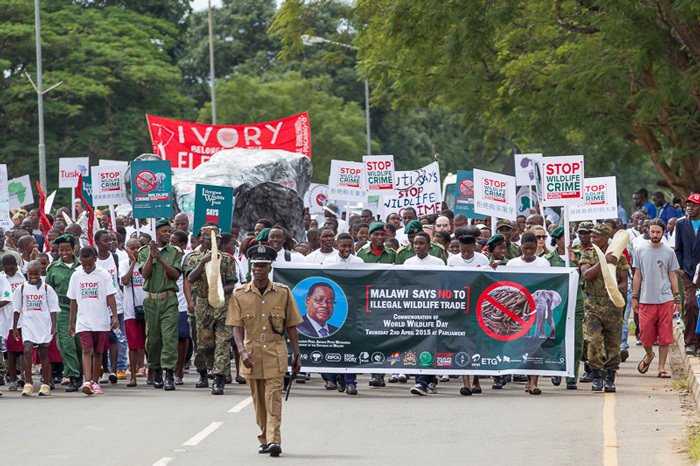 Last Thursday Malawi’s World Wildlife Day commemorations caught the attention of the world when the president, His Excellency, Prof. Arthur Peter Mutharika, stepped out to lead the country’s biggest demonstration of support so far in the fight against wildlife crime. 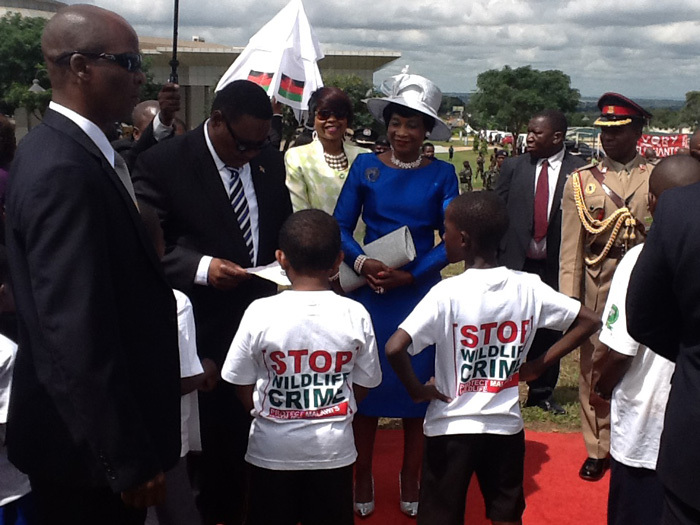 The commemorations represented a peak in Malawi’s ‘stop wildlife crime’ campaign. Colourful and vocal crowds walked to parliament where they were met by the president who in turn accepted over 7,000 signatures supporting the government in their decision to say ‘no’ to ivory. His Excellency then viewed the ivory stockpile and unveiled a plaque, perched on a hill that overlooked parliament and Lilongwe as he was cheered on by well over a thousand onlookers. Following this he then retired to the presidential suite for the first viewing of the ‘stop wildlife crime’ film in the presence of government officials and the directors of campaign partners, the Department of National Parks & Wildlife and Lilongwe Wildlife Trust. The 8 minute film, launched here by Africa Geographic, is an informative and emotional plea from Malawians who believe in the importance of protecting their country’s wildlife. From school children who wish for their children to one day see an elephant, and enforcement officers striving to bring poachers and traffickers to justice, to the dedicated park scouts who have witnessed the butchering of elephants first-hand, everyone has their own reasons for why they want to put a stop to the illegal practices which could well lead to the extinction of Africa’s most iconic species. 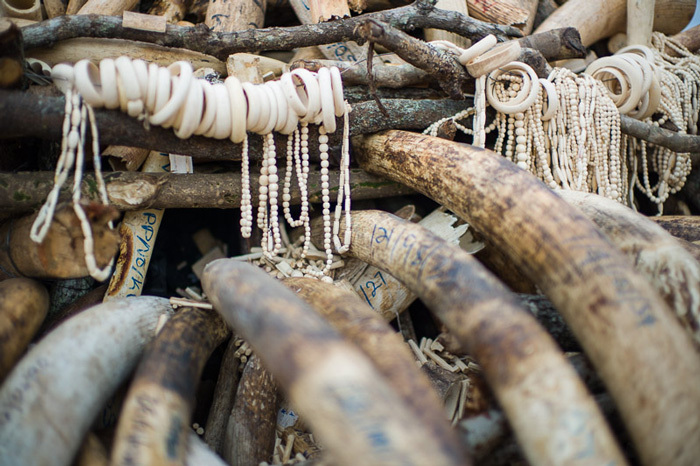 A staggering 25,000 of these elephants are estimated to be killed every year for their ivory tusks. If current rates of poaching continue they are set to be extinct in just ten years’ time, already a reality in countries like Sierra Leone and Senegal. Exact data for Malawi is scarce but one source estimates that 71% of Malawi’s elephants were lost between 2002 and 2006. 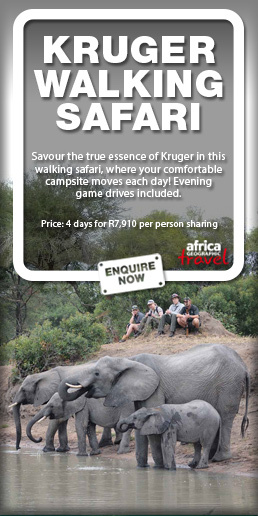 In its heyday Kasungu National Park was teeming with so much wildlife that stock was sent to South Africa’s famous Kruger National Park. Now that 2,000 strong elephant population of the 1980s is down to an estimated 58. Malawi’s elephant population may be smaller than that of its neighbours, at around 1,500, but these are still important populations and the country is vulnerable to exploitation, as a target by traffickers coming from the surrounding countries of Zambia, Tanzania and Mozambique. Wildlife crime could rob Malawi of its natural capital and cultural heritage, undermining the livelihoods of natural resource dependent communities (which includes many of the 16.5 million citizens), damaging the health of the ecosystems we depend on and undermining sustainable economic development such as tourism. With the elephant crisis now surpassed its tipping point, attitudes worldwide must change in order to save the elephant, coupled with swift and strong action. As seen from last week’s commemorations, Malawi is certainly taking its own fight against wildlife crime very seriously and the results are beginning to show. In just one year, there have been stiffer sentences, better inter-agency cooperation and the reviewing of wildlife acts. The English version of the ‘stop wildlife crime’ film is currently being shown on national TV with feature length programmes aired on the radio in the local language of Chichewa. There is also a Chichewa version of the film in production. 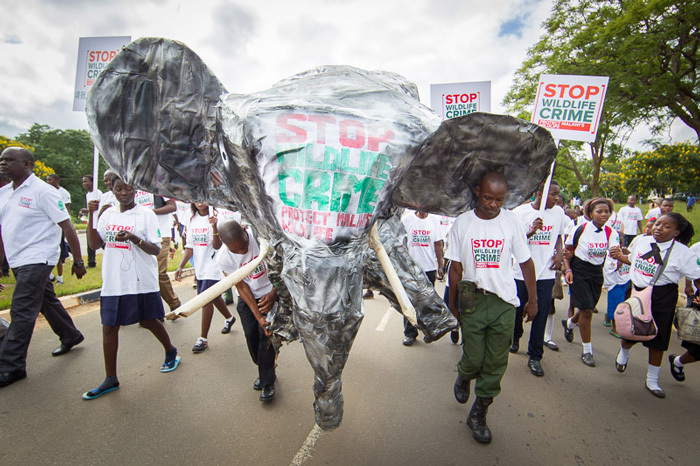 Go to www.malawiwildlife.org for more on the ‘stop wildlife crime’ campaign. Film by Jamie Unwin, commissioned by Lilongwe Wildlife Trust and the Foreign & Commonwealth Office.